St Andrew’s is thought to be an early nineteenth century rebuilding of a medieval church although no perceptible early fabric remains. 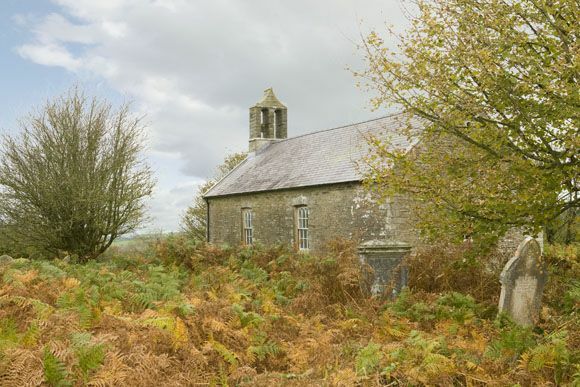 Indeed the church is valued for its survival as a modest but evocative late Georgian Anglican box with Gothick windows, and a completely intact, single chamber interior. The chief joy is the painted and panelled pulpit and reading desk, the former so tall it almost touches the ceiling with its sounding board. There remains a complete set of box pews and an unusually elaborate memorial tablet against the east wall. This commemorates Morris Williams of Cwmgloyne, in the parish of Neverne, who died in 1840. The interior also houses a modest twelfth century square font. Bayvil is listed Grade II*. The church is pictured in the Pevsner guide to Pembrokeshire by Thomas Lloyd, Julian Orbach and Robert Scourfield (Yale, London, 2004). It is described there as a “rarity” of the 1830’s by David Evans, its pre-ecclesiological interior “of delightful and luminous simplicity”. Bayvil Church is also featured in the 2003 volume of Ancient Monuments Society (AMS) Transactions. The Friends share an office and operate a joint membership scheme with the AMS, and each year a Friends church is featured in the AMS Transactions. The 2003 article, which also examined the Friends nearby church at Manordeifi, was written by Dr Nigel Yates, and can be ordered by contacting the office. In the article Dr Yates describes how the church is largely undocumented and thus cannot be precisely dated. However in 1813 and 1828 it was served by a non-resident minister, also vicar of the nearby parish at Molygrove and rector of Martletwy in South Pembrokeshire (who in fact lived at Emsworth, Hampshire). Dr Yates suggests that as the bell-cote at Bayvil is similar to that formerly at Eglwyswrw (where the curate lived), the church at Bayvil was built sometime between 1810 and 1830. The architect may have been David Evans of Eglwyswrw, a local architect with an office in Cardigan, who built other churches locally including those at Cilgerran and Llechryd.